Chances are you have been overcharged or cheated by a taxi driver. Maybe the driver took the long route or failed to turn on the meter, surprising you with an unexpected fare. It happens even to the most seasoned travelers. Using a ride-sharing app, such as Uber, can be a way to avoid potential problems of that nature, but driver dishonesty can still happen. I found myself the victim of one such case, and I was able to resolve my situation, using a local taxi-hailing app. If Uber or Lyft is not available, especially if you are overseas, there are alternatives to ensure a safe and honest ride: taxi-hailing apps. Or so I thought. Let me detail the transgression. The taxi meter read €69.70, and I was upset. 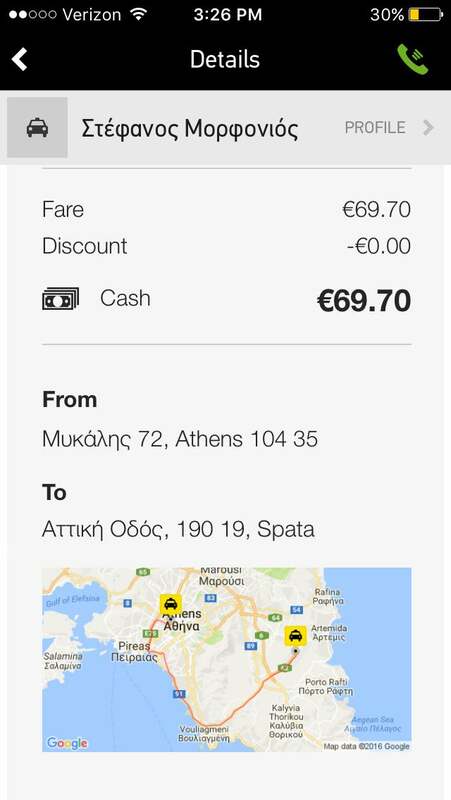 I was promised no more than a €55 fare to Athens International Airport. Well, that’s what the app had said. No, not Uber: Beat, an app that connects passengers with traditional taxis in Athens. I am a budget-conscious traveler, and even a wasted €15 bothers me. I’ve been overcharged before, but this was different. Saved on my iPhone was evidence of this cabbie’s misdeed. When a taxi driver rips you off abroad, you often have no recourse. But technology lets travelers protect themselves, as I experienced in Athens. For a 6:30 a.m. flight to Paris, I wanted a taxi at 4 a.m. as the metro wasn’t open yet. I had requested an Uber, but no cars were available. I punched my journey details into Beat, and it indicated a fare of €40 to €55, which I accepted. Three minutes later, a licensed, yellow taxi was at my doorstep. After greeting the driver with my limited Greek, I asked for the airport, and the driver nodded. So far, so good — until things turned south, literally. Before proceeding to the E75 highway, the driver abruptly stopped the car and fidgeted with the GPS. Sensing confusion, I asked whether he was lost and reiterated my desire for the airport. He appeared confident and turned left on to E75. I didn’t know it then, but the driver was heading south; the route didn’t resemble the preview I approved. A few minutes later, he exited the highway, then stopped again, making a sharp turn. I became suspicious. What taxi driver doesn’t know his way to the airport? I glanced at my phone and saw that we were too far south, near the Port of Piraeus. A bead of sweat dripped down my forehead. We both said things neither understood, and he pointed to his GPS, which appeared fixated on the airport. I shut up and let him drive, but I feared the worst: I would miss my flight and subsequent connection to Newark. During the next 20 minutes, my fear that we were headed somewhere other than the airport passed. But I also saw the meter inch past the expected fare and rehearsed how to handle the payment. The taxi driver took the long way to Athens International Airport. I had two choices: Fight it and risk police intervention and miss my flight, or pay the man, begrudgingly. I initially fought the fare by stating the expected amount. He shrugged. I insisted that he charge my Visa, knowing I could dispute it later. He denied. I didn’t get my way, and handed him €70. The taxi driver had ripped me off, but I got the last word. I used Google Translate to write a scathing review in Greek on the driver’s Beat profile. And while I anticipated zero compensation, I still wrote Beat’s customer service. In less than 24 hours, my Beat account showed a €15 credit. Great, but would I ever redeem it? We have already taken all actions needed in order to never happen a similar incident in the future, he made a wrong route decision and he should be a lot more careful in the future. If you ever visit Athens again, we will be more that happy to serve you! No matter the location or the ride, stay digitally connected and vigilant. Use an official taxi or ride-sharing/hailing app, and pay with a credit card. Without a digital record, getting a refund is nearly impossible. Show the driver the journey and the cost on your phone to avoid any confusion or funny business. Monitor the journey on your smartphone map, even if it’s offline. If things go wrong, write a review and email a complaint with your desired make-good. Uber in Europe typically is flawless. I’ve rarely had an amateur driver. Usually, it’s a moonlighting pro with an Audi or a Mercedes, and dressed for the part like something out of “The Transporter.” That said, depending on the location, a taxi may be more convenient and quicker than Uber. And with no surge pricing, the fare may be cheaper. Beat is only available in Athens, Santiago, Lima, and Bogotá, but look for one of these apps that offer widespread service. A favorite alternative to Uber in Europe is mytaxi. Service is available in over 70 cities, including many where Uber is prohibited. It boasts the most registered taxi drivers in Europe after it merged with competitor Hailo in 2017. You can schedule a pick-up and save your favorite drivers. Popular cities: London, Dublin, Barcelona, Berlin, Cologne, Krakow, Madrid, Milan, Munich, Rome, Vienna and Warsaw. Grab serves the Philippines, Vietnam, Thailand, Singapore, Malaysia and Indonesia. Even if you can’t use your cell phone you can — in Manila for instance — order a ride from a Grab airport kiosk or at your hotel. China’s Didi is now available in English, running in about 300 cities there. It’s a must have because many residents use the app, which makes finding an open taxi challenging, as I learned in Beijing. Some US-based credit cards don’t seem to register so you may need to try a couple. Also, anything you text to the driver is automatically translated into Chinese and vice versa. Uber’s license was not renewed in London but it is still running on provisional status. Enter Gett, the popular taxi-hailing app with nearly half of all London black cabs running on the platform. Gett has the market cornered in Russia and Israel too. Look for it also in Liverpool, Leeds, Manchester, Birmingham, Glasgow and Edinburgh. Japan Taxi shines where Uber is non-existent. The app operates in all 47 prefectures while Uber only runs on the island of Awaji. Other features include pre-booking and flat-rate lifts to the airports.